springs | Water We Doing? Panchkhal Valley in central Nepal is one of many areas in its middle mountain region that has progressively suffered from drying water sources in the last decade. Unless someone is regularly measuring the discharge to compare with the base line information, the dilemma with water is that when its sources begin to deplete initially, it is difficult to verify let alone quantify it, which many people including the decision makers demand to get convinced and take the matter seriously. Unfortunately, we do not have such baseline figures for water sources in the villages. And of course, no two successive years have the same quantity of water flow anyway: there is variability. So, most people consider depletion of sources, when they are reported, as a normal phenomenon. Some even take the easy way out to blame the users for extracting more water causing the depletion. But the water problem being observed in the Panchkhal Valley seems to be more than that, and if not taken seriously can be lot worse in the next few years. It was only in 2007, that few springs in the upland showed sign of drying earlier than in the years before. Irrigation channels had reduced flow in May when farmers needed to irrigate vegetables. Some irrigation channels had stopped supplying water due to lack of water at the intake. Farmers in upland could no longer grow vegetables that they had been growing for more than three decades, while the land in the valley along the Jhiku Khola (the only stream in the valley) were covered by rich green farms because farmers there were pumping water from the Khola using kerosene pumps. In general, vegetable supply from the area suffered. The story of water shortages became news. Government declared some of these areas as ‘drought affected’ especially after the paddy plantation failed. Since then, the valley seems to be getting drier every year. The springs in the lower parts of the hills, which are supposed to yield sufficient water even in the driest month of May and June have also reduced discharge. As a result, the local water sources such as wells and Kuwa had to be put under lock and key to save remaining water. Further down in the valley, the Jhiku Khola has responded in the similar manner. It has ceased to flow even in the middle of the monsoon. In winter, the dry Jhiku Khola is used as road by trucks that go into the inner villages to collect vegetables. Potato is grown in winter in the valley. Potato crop requires lot of water which the farmers extracted by digging pits in the river bed. Because the Khola does not have flowing water, every farmer having land adjacent to the Khola dug such pits that cost about 10 – 20,000 rupees to dig using bull dozers. The pits used to provide enough water for pumping daily. Come monsoon, the pits got filled with debris rocks and sand. Farmers had to re-dig the pits the next winter. There are hundreds of such pits all along the Jhiku Khola. As the Khola has not flooded like in the past for more than three years, the pits have not been filled with debris. Since 2013, the scenario began to change further. Water in the pits also went down. Water can be pumped every other day limiting the area that it can irrigate. 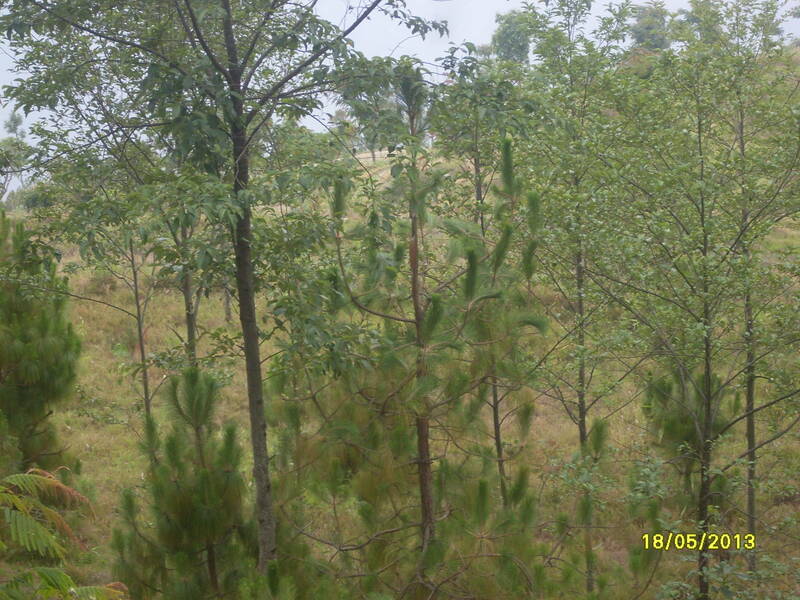 What this means is that the green farms that existed around the Khola have shrunk in size. Lack of irrigation at critical times has now cost dearly for farmers. The ponds have been developing scums, which is an indication that the farmers have not been pumping as much water as in the past. Consequently, many terraces either remain fallow or have dying maize vegetable plants on them. The efforts of the past four decades to improve agriculture in the valley by making irrigation channels (there are more than 30 such channels) and other inputs have turned out to be going in vain just because the water sources have ceased to exist in many areas. It is a national loss. One does not need to begin calculating what the costs of drought is. 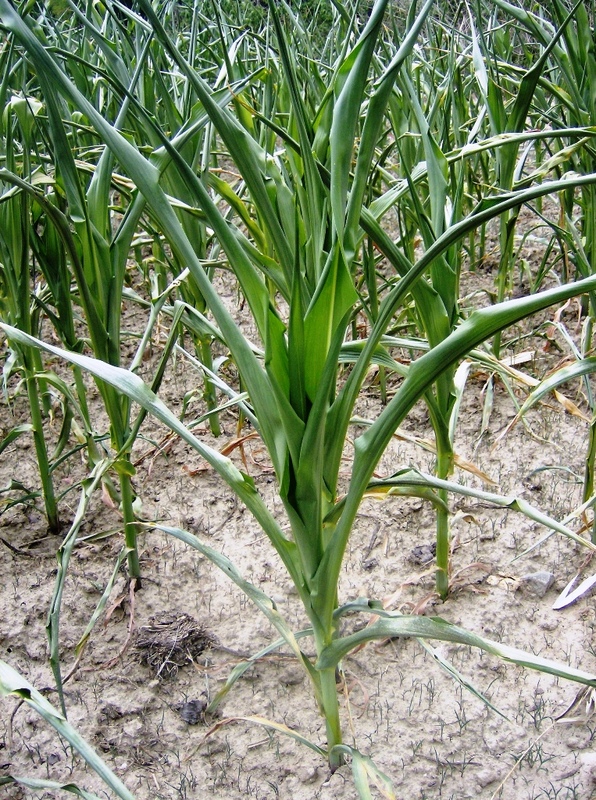 It is purely seen in the naked field that have dead maize plants at a time when it is about to bear fruits. NB: Photo by: Arun Rai taken on May 24, 2014. What is the steepest trail in the mountains that one can imagine walking on? The metaphorical representation of such a slope in the Nepali language is naak thokkine ukalo, i.e. a slope where one’s nose hits the slope while walking uphill. Such a trail is a ‘no–no’ even for a village person, but there are millions of such not so fortunate people, especially women, who have to walk daily on those trails to fetch domestic water, because the water sources are found in the springs that only appear hundreds of feet below the villages. This situation in most water literature is referred to as ‘women need walk for 2 to 3 hours to get water’. What these literatures do not mention, is the fact that more than half of this 2 to 3 hour involves walking uphill on one of those naak thokkine ukalo with a gagro (water pot) on the back. This uncompromising verticality could not deter Nepali villagers, from making their living on these acutely water scarce villages for hundreds of years. With development, came water supply projects. Water projects became priority of politicians and planners alike in order to reduce this drudgery. Within three decades water supply coverage in the country crossed 80% mark, making all those involved very happy. Indeed, it has been a remarkable achievement. But the story does not end there. The drudgery has not ended; rather it has increased for a different reason that many water planners have no information about, and those who have information have no idea of what is going on, let alone finding solution to it. One can only be stunned upon learning the fact that springs have dried out after three decades of successful forestry programme in restoring greenery in the once degraded hills. Something unusual is happening to the nearest water sources of these mountain villages. Drying of springs is not limited to drier areas of the country but to other places as well. As a response to the water crisis, people are migrating to new location where water is available. Shortage of water has also forced people to abandon villages. In the far-western district of Dadeldhura, for example, thirty families from two villages of Navadurga VDC close to the district headquarters, 23 families from Alital and 10 from Jogbuda have abandoned their villages due to water scarcity. The newspaper reports that Nwali, Makawanpur and Bhitrisain villages of Alital, and Rampur, Damang and others in Jogbuda have almost become empty. In some villages, the villagers have banned bathing in taps due to water shortage. The officials admit that more than 60 per cent of water sources in Dadeldhura have dried due to drought. The story in the eastern part of country, which supposedly receives high rainfall compared to the west, is no different. More than four dozens families of Soyak VDC- in the district of Illam in eastern Nepal have been displaced in the past few years due to water scarcity. According to the reports, migration is on the rise because of water crisis. Villagers have a hard time finding buyers to sell their land. Most of the people in the village have migrated to the Tarai region where groundwater is easily available. It was not a surprise to find that people in the village of Dhe of the rain shadow region in Upper Mustang, had to move to lower plains because the water from what little source they had, had gradually dried up. This has left the villagers with no option but to move. The entire village is shifting to the lower area close to Kali Gandaki flood plain where water is available. There are equally alarming stories of water scarcity reported from the central part of the country. More than 300 households of village of Chharchharedada in Belghari VDC of Sindhuli were displaced after water sources dried making their already hard lives even more difficult. They migrated to lower valleys for five to six months only to take turns to look after their land and houses in the village until the springs got recharged in the monsoon. Most of the villagers made small huts close to the local streams below the villages. Those with no land close to the stream had to take refuge at relatives’ places. Chharchharedada does have a well, but the water yield is so low that a person needs to wait for more than two hours to fill a bucket of water. Only the person reaching the well early can get water whereas other are forced to wait in a long queue or walk more than 5 kilometers and spend an entire day to bring home a bucket of water from a nearby source. Something unusual and perhaps very serious is happening to the water sources in the hills and mountains. What is needed is not just debates on whether the climate is changing to affect water sources, or collecting more hydrological data to prove that things are changing significantly, or implementing cross basin water transfer projects; but simple solutions to help these people who endured unimaginable hardship of walking on naak thokkine ukalo with gagro full of water, and are now forced to abandon their homes. The challenge in front of the venerated water experts of the country is to suggest doable solutions. This is a follow up to my last post on ponds in Dapcha area where water shortage had forced people to look for ways to increase spring discharge. I visited the place to see whether the small ponds dug before the monsoon last year had any impact on the water sources. What had become clear was the fact that Dapcha has begun to experience water shortage more frequently. A local resort was already buying water in the dry season from water tankers that hauled water from as far away as Banepa located about 20 kilometres away. Demand for water increased due to increased flow of tourists and pilgrims to the sacred Monastery and the holy place of Namobuddha. Since there was no possibility of bringing water from other sources, it was necessary to manage available water sources to their full potential. As a response to the problem, six ponds of about 100 square feet area each were dug above the springs that provided water to a local resort. Water from areas around the ponds was diverted to the ponds using earthen channels. Surprisingly, the ponds never got filled even in the middle of the monsoon. Water in the ponds seeped in so quickly that none of the ponds had any water left standing after each storm. It only suggested that a large amount of rain water in fact went into the ground which otherwise would have flowed to the stream the same day. The resort has not bought water from tankers this year. Encouraged as we are, we plan to dig few more ponds this year to save some more rainwater.